This program of twenty-nine separate audio lessons is designed to guide the listener through a step-by-step progression to increasingly higher states of consciousness. There are many exercises along the way and it is strongly advised to master the teachings in each step along the way without rushing. All the steps are self-explanatory, however other lessons are indicated that help the participant to branch off for deeper inquiry in this site or others. 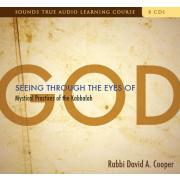 All 12 Steps are included in the CD set SEEING THROUGH THE EYES OF GOD available for purchase through Sounds True from this website.